The other night, I introduced my classmates to the Victorian phenomenon of bicycle face. Before I revealed what bicycle face was, my classmates had a few guesses. Was it when you went over the handlebars and faceplant? Or was it getting chapped skin from the breeze blowing in your face? Actually, it is none of the above. Some doctors in an effort to keep women from riding bicycles began to tote the condition of bicycle face, which caused women to become flushed or pale, their faces strained from fatigue, jaws clenched, and eyes bugging. But why mention this odd phenomenon if it doesn’t seem to be anything but normal fatigue from physical activity? Because the bicycle was a means of liberation for the women of the late Victorian era. With the rise of the bicycle, women were no longer confined to the home. They could travel longer distances and were only limited by their own physical ability and not by having to borrow their husband or relative’s horse, and even then, she would have to ride sidesaddle. 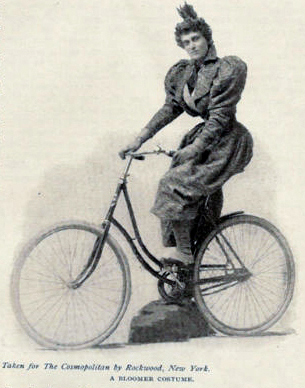 Since skirts are impractical, women also began gravitating toward the fashions of the Rational Dress Movement, which advocated that women wear bloomers while taking part in physical activities like bicycling. Of course, men and women alike didn’t want to see women in trousers or knickerbockers. How scandalous to have one’s calves defined, especially while donning menswear! Women would lose their femininity. They would join the suffrage movement and want rights, and if they had rights, they would throw off the yoke of wifehood and become liberated. Oh how like men they would be! So how did the patriarchal medical community decide to take on women riding bicycles? They chose to play on their vanity. Dr. Shadwell, a well-known Victorian physician and opponent of bicycling for women, also believed it would cause palpitations, headaches, insomnia, depression, and many other maladies. Doctors like Shadwell hoped to play on women’s fears of losing their looks and men’s fears of having an unattractive wife, especially since a woman was supposed to be a direct reflection on her husband. What else would the angel of the house worry about but her looks? And if she didn’t care about them, surely her husband would put her back in her place and pop her tires. Some doctors proclaimed that bicycle face would go away once the activity ceased, but others hoped to scare women away from ever trying by stating that the effects of riding a bicycle were permanent. Other doctors even believed that riding a bicycle would cause fertility problems for women because they were constantly bumping around on the hard seat. By the end of the 1890s when it was clear that women and bicycles were not going to part, the myth of bicycle face began to die out. To put the final nail in the coffin, female physician Dr. Sarah Hackett Stevenson said she had been suggesting bicycling to her patients as a form of exercise and that bicycle face was nothing more than the normal anxiety of a beginner rider. If one wonders which doctor they should trust, Dr. Shadwell has faded into obscurity while Dr. Stevenson was not only the first female member of the American Medical Association but wrote three medical texts about women’s physiology and what women needed to know about their own bodies. Next time you take your bike for a spin or run over a pothole, try not to clench your jaw or eyes. You never know if it’s going to stick. If you would like monthly updates about research, book reviews, and interesting articles, please consider signing-up for my newsletter by clicking the button below. I’m going to put forward conversion therapy, anti-vaxers, things like that.